Filling: Brown the pine nuts in 3 tablespoons of butter and set aside. Sauté onions and add 1⁄2 lb ground meat and brown. Stir in pine nuts and other ingredients (except oil). Set aside to cool. 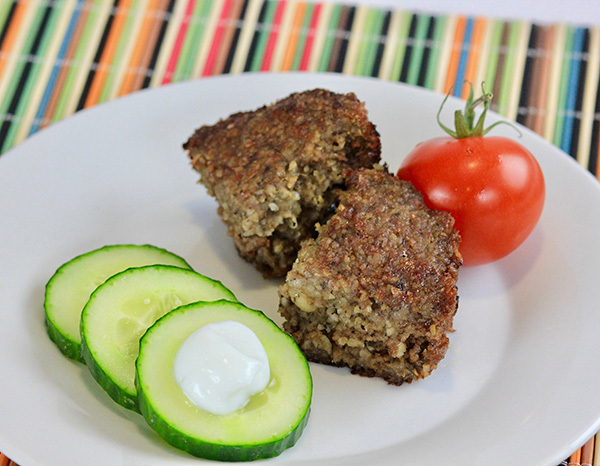 Make kibbee following instructions on mix package using 1 package of Jemila Kibbee Mix and 1 lb of ground meat. Divide kibbee in half. Layer first half covering the bottom of a 9” x 13” baking pan. Spread filling evenly over first layer. Cover filling with remaining half of kibbee. This step will be easier by flattening portions in your hands and pressing in place until fully covered. Moisten fingers when smoothing the top. Make a 1⁄2” hole in the center of the Kibbee, to the bottom of the pan. Cut into 1 1/2” squares or rectangles. Pour olive oil evenly over the top. Bake 20-25 minutes in 425 degree preheated oven.